Today was the day .. I erased the Be My Valentine Chalkboard ! 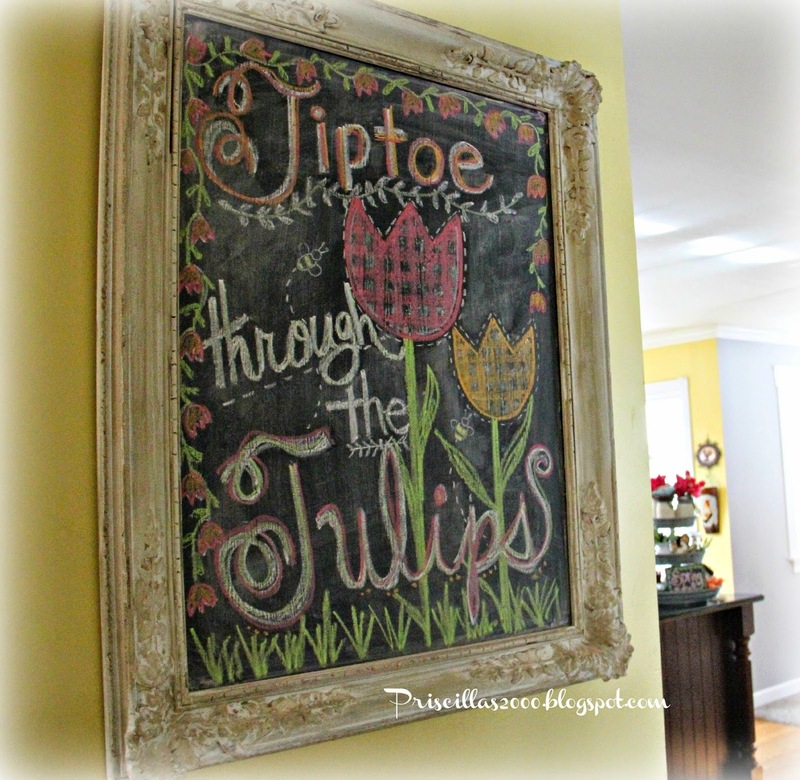 It is so cold here ..its time to get some more Spring in the house.. Tulips and bees are the theme for this chalkboard. Hi Priscilla! Oh, this is so cute! 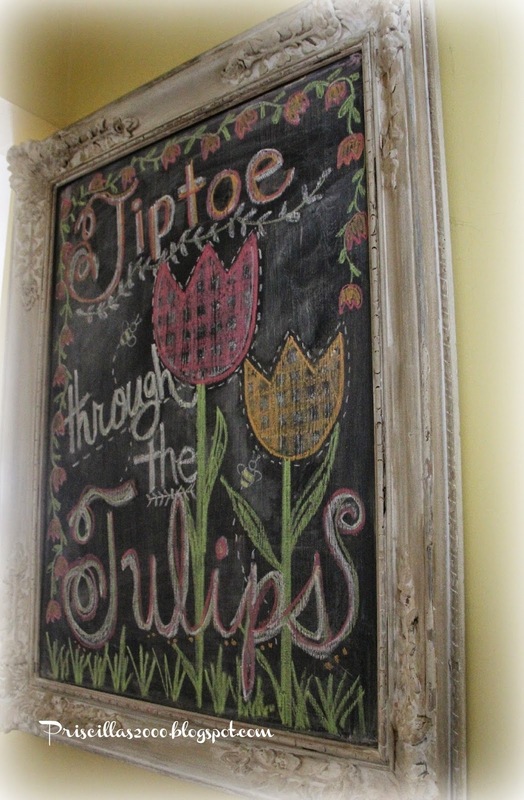 You're really good at the chalk board art! A little spring is always good. 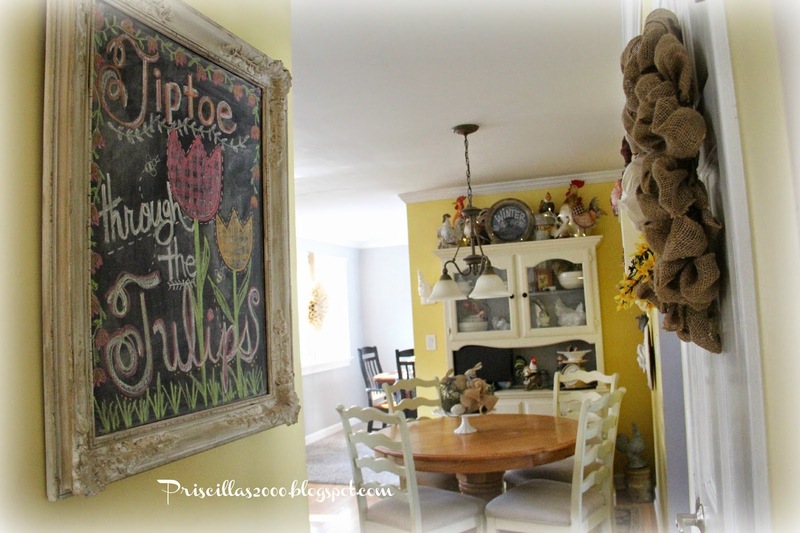 I hope your lovely Spring chalkboard will bring you better weather!! Great! I am always very amazed about your ideas. Your chalkboard is wonderful. Hope the weather will be better and warmer soon. Winter in Germany is again not very cold. Hard to even imagine spring here... we are coming out of a brief snow yesterday that left about two inches, and tonite will start a big one, with predictions of 5-8 inches, then 1-3 tomorrow morning before it stops! I think that is enough!! 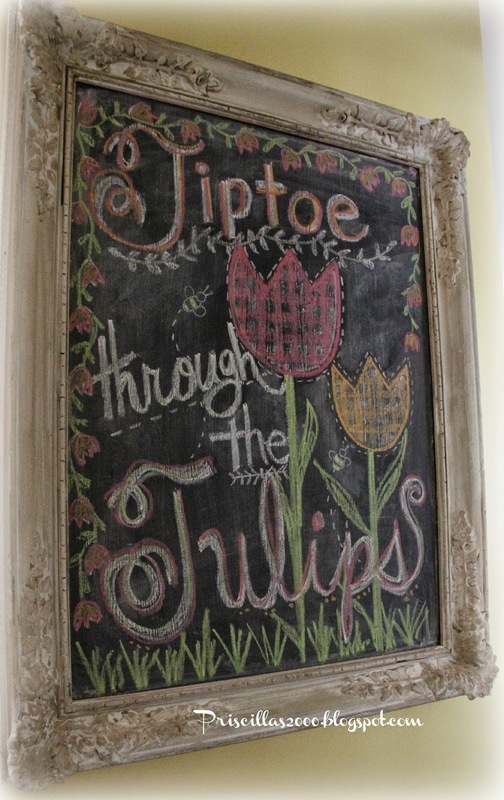 I want your cheery tulips!! Oh, my stars! 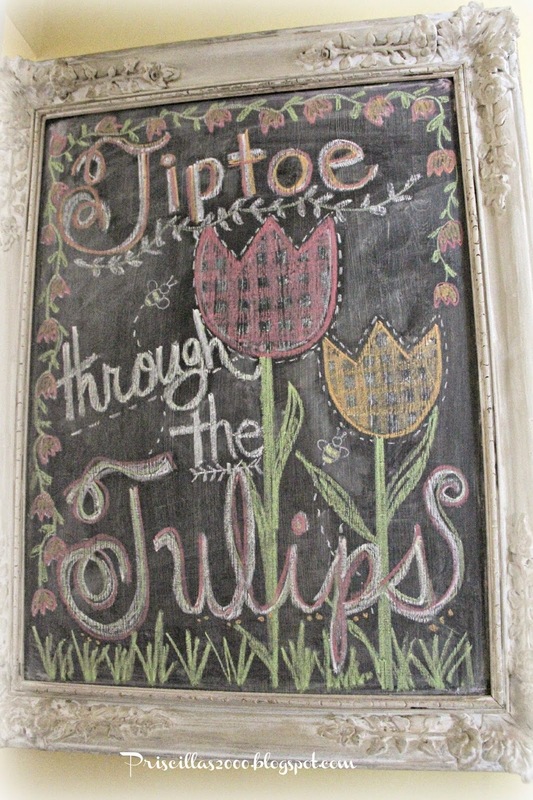 After checking out the tulips board and the Valentine's board, you are definitely my new chalkboard inspiration person! This looks incredible. I am inspired to try to redo mine today - though I don't have the artistic ability to pull off one as elaborate as yours. Thanks for sharing! Stopped by via Amaze Me Monday! I love this! The color chalk makes me so happy to see. 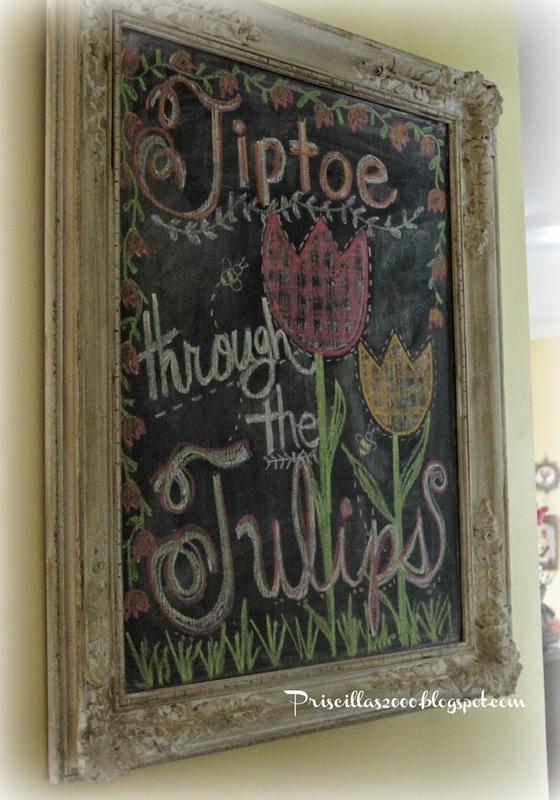 I would love to be able to replicate this look, but I have a hard time doing such detailed chalkboard art. You did an outstanding job. 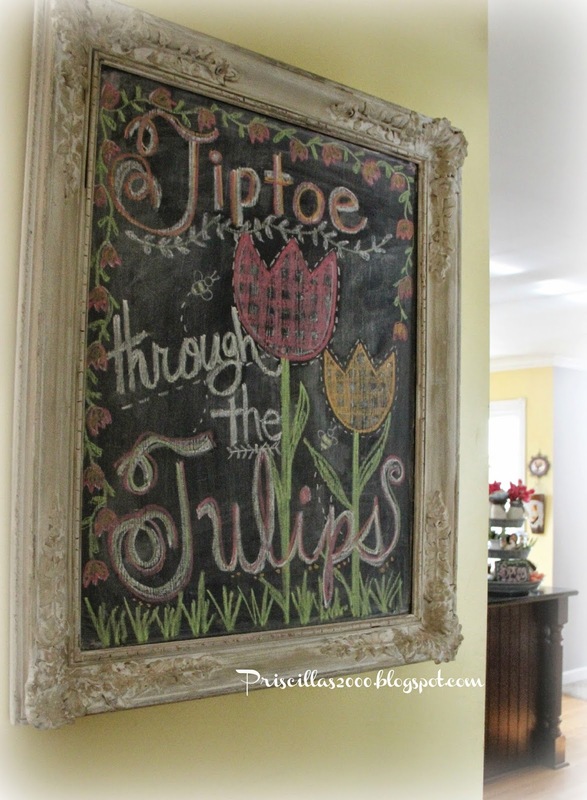 Your chalkboard drawings/writing is VERY good! You do have an artistic ability! I love the two little ceramic birds that you have in your Spring vingette w/ the vintage scales....where did you get the birds? I am a newcomer to your site and LOVE your designs/ideas! Have a GREAT weekend!! !